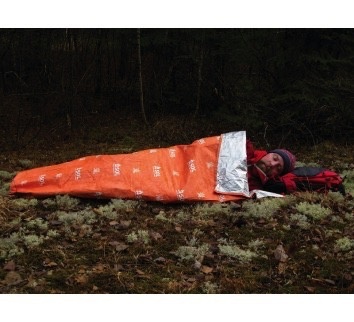 TECHNICAL Weight: 155g Reflects 70% body heat Breathable and weather resistant DESCRIPTION You want to go 'Light and Fast' but you need a backcountry shelter that breathes. The SOL Escape Lite™ Bivvy was developed especially for you! Constructed with AMK’s proprietary Escape fabric and with a minimalist design the Escape Lite™ weighs in at only 5.5 oz and packs incredibly small. The proprietary fabric lets moisture escape at the same time that it keeps rain, snow, and wind on the outside – all while reflecting your body heat back to you. 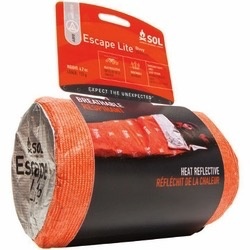 The Escape Lite™ is no one-trick pony either, use it as a liner to enhance the warmth of your traditional sleeping bag, as an ultra-light weight summer bag or as an emergecy bivvy. Now you really can go further and explore longer!